This weekend (Friday), I had the privilege to present three sessions at the Iowa Music Education Professional Development Conference (I usually just call this the Iowa MEA). If you are in a surrounding state, I really recommend this conference. It is a smaller conference and most of the vendors are local–but clinicians come from across the country to present on a wide variety of topics. Don’t let the size of IMEA fool you–it is packed with professional development. My first session was a summary on the latest with the iPad in Music Education. (PDF of the presentation: The Latest and Greatest with iPads in Music Education). In summary: better hardware, better iOS, better [and continually improving] apps, and better accessories for music education. My second session was an overview of some of the ways you can use devices OTHER than iPads in your classroom (PDF of the presentation: Technology for the Rest of Us). This was a discussion of web apps for all, Android, Chromebook, and Windows “Tile” Apps. There was one big surprise about Chromebooks that I will be blogging about soon. I also recommend Chad Criswell’s post about High Tech options for low-cost budgets: http://www.musicedmagic.com/tales-from-the-podium/low-cost-musictechnology-options-for-the-music-education-classroom.html. The final sessions was my core “60 Apps in 60 minutes,” which is more than 60 apps. (PDF of the presentation: 60 Apps in 60 Minutes). On the positive side of things, my overall list changes very little over time–but the best apps continue to improve with each passing generation. As a secondary teacher, it is a joy to be able to recommend Amy Burns’ FREE interactive book, “Help! I am an Elementary Teacher with One or More iPads” to elementary teachers looking for even more elementary-focused apps, applications, and lesson plans. I love presenting in Iowa–it is a relatively close convention (about a 3.5 hour drive from my house) in a wonderful town (Ames), and Des Moines is only a short drive away. On Saturday, my wife and I drove down to Des Moines and visited the Iowa State Capitol (it is a beautiful building–if you have not visited it, do so) and then went to blow our own glass Christmas ornaments at Studio Fuzzishü in the West Des Moines area. We wanted to spend some time in the East Village and perhaps at the Jordan Creek Mall, but parking was an issue in both those places. We also had the chance to visit some friends of the family that had moved to Southern Minnesota on our way back to the metro area of the Twin Cities. I had the pleasure to receive a review copy of Hugh Sung's new book, “From Paper to Pixels.” Mr. Sung is a classical pianist who has been dealing with digital music for the past twelve years. In the process of going digital, he longed for a device that would turn pages wirelessly for him (he explains this at the end of the book), and eventually developed his own page-turning device. I own an AirTurn device, and I couldn't be happier with it. I originally owned a device from a competitor, and I bought that other device because it was cheaper. As with all things, you get what you pay for. The AirTurn is worth every penny–and truthfully, it isn't much more expensive than its main competitor. As a side note, if you need an AirTurn at a bargain price, there are occasionally a few reconditioned models available at a discount from the AirTurn website. Hugh Sung is the world's leading expert on converting paper scores to electronic scores. His book details every step of that process–both his own conversion to digital scores, as well as every aspect to the process of your movement to the use of digital scores. Throughout the book, I found myself nodding in agreement to his conclusions–for example, using PDF as a platform for all your digital music, and scanning in black and white (or even better, text) at 300 dpi. Mr. Sung makes the point, again and again, that if you scan things correctly, they will be useable for years to come, regardless of the device of the day. As AirTurn has a relationship with a lot of developers on every programming platform (Mac, PC, iOS, Android–not sure about Linux), it was important for Mr. Sung to remain diplomatic as he describes different devices and apps that can be used for digital sheet music, and he does this with class in the book. There is no doubt that the book is slighted towards the iPad, as the iPad has the most options for music readers–but he gives fair time to Windows, Mac, and Android as well. When he discusses various apps, he makes sure to point out a killer feature of each app. And the best part–in my opinion–is that he also devotes some time to describing his current set-up, naming the device, app, and accessories that he uses. I have a hard time being “mean” about an app or a product–I dislike hurting feelings, because I respect that some people have different opinions than I do. I have had two run-ins with developers over the years when I wrote critical things about their app. App developers are highly sensitive about their apps, as they are usually personal creations that are an extension of the developer themselves–criticising an app can be like criticising their children. As a result of these conflicts, I have shied away from “true” app reviews and instead focus on sharing the comments from the developer–except in cases where I purchased the app myself and have a personal interest in the app (e.g. I want to use it in my job). Mr. Sung mangages to avoid any aspect of being “mean” in this book–he leaves the decision about computer platform, apps, and accessories firmly in the hands of the reader, while still expressing his personal choices. My only fear is that many readers will read the book and remain unclear of what path to follow; in that case, my suggestion would be to follow Mr. Sung's choices as a starting point (his choices would also be my choices). Many musicians are secretly hoping that Apple will eventually release an XL-sized iPad. I feel that four additional products that should have been mentioned in the book. One is an app, SeeScore, that turns MusicXML files into dynamic sheet music on your iPad. MusicXML is a wonderful standard that brings more and more accuracy between music notation apps with every new version. MIDI is great, but when it comes to music notation, more accuracy is needed than what MIDI can provide. Two products that were not mentioned were styluses–I think the Applydea Maglus is a fantastic stylus, and I love the fiber mesh tip of the Boxwave Evertouch. The price on the Boxwave is outstanding, too. Finally, as music notation apps are mentioned in the book, I feel that Notion deserves to be mentioned along with Finale, Sibelius, and MuseScore; partially beause Notion works so well and is priced right ($99! ), and partially because of its iPad app (the iPad app is mentioned in the book, but files between the Win/Mac and iPad versions can be exchanged–and the iPad app is improving at an unbelievable rate). Most importantly, I would love to see “From Paper to Pixels” become an iBook in the iBookstore, with interactive videos. Many of the chapters of the book are dedicated to step-by-step processes that would be better served with a short video tutorial, videos that could be embedded in an iBook. Let's be honest, the majority of people with the capability to “go digital” are using iPads, so it would be very much worth the time to make an iBook version. Unlike Apple iPads, which try to hide those rooms full of rusting filing cabinets filled with creaking drawers stuffed with mind-numbing stacks of dog-eared file folders behind clean, shiny icons, Android tablets keep the office storage door open for you to peruse the stacks and see what a glorious mess of data you accumulate over time. It's amazing how fast your music library will grow with just 15 minutes of scanning a day. As the proverbial saying goes, the way to eat an elephant is one small bite at a time. Nowadays I actually feel safer with my iPad sitting on my piano rack than with a wobbly piece of paper music that might have pages stuck together due to humidity on stage, or binding that's too stiff to keep the pages open, making them susceptible to being blown over by an errant draft. On a related note, let me add that repeats, D.S. and D.C. markings, cuts, and score addendums also make digital music a far cry better than paper music. There is a lot to love about this book; it is a clear guide on how–and why–to go from paper music to digital music. What I've failed to note is that Mr. Sung also brings a great deal of humor to the book, so it doesn't read as a dry academic text (not that all academic texts are dry–but we all know some that are). Quite the contrary–it seems as if Mr. Sung is having a conversation with the reader. He definitely seems like the type of person that would be a great friend and colleague–this comes through in the tone of the book. Also check out the checklist for using digital music at the end of the book–very practical advice from someone who is already on the journey. As I present at conferences and workshops, two areas of concern crop up in every location–how to deal with wireless mirroring and scanning. I deal with these areas loosely in my upcoming book–but I will certainly refer readers of that book to Mr. 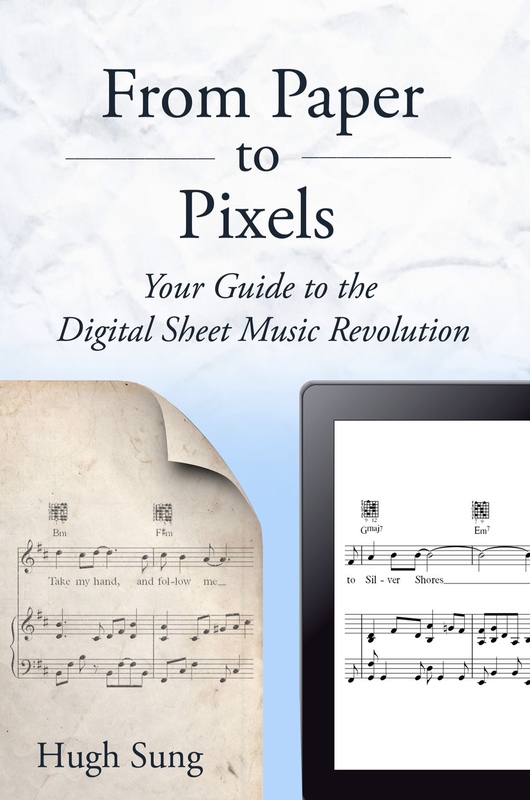 Sung's book, and his book will also be recommended in my presentations that deal with moving from paper to digital music from this point forward. So yes, I recommend the book to you–it was an enjoyable read for me even though I consider myself an expert in the field. I also enjoyed the chapter on the history of digital readers, the case studies of people using digital readers, and the background of the AirTurn pedal. The book goes on sale in paperback on August 1st for $19.99, and can be purchased at Amazon as a Kindle book or from AirTurn for $9.99 in an eBook format. Other websites and blogs are putting out their “Best of 2012” lists, and that has made me want to write my own best of 2012 list. A word of caution: these are my opinions, and mainly reflect the use of technology in music education. There aren't many surprises in this list, as 2012 was a year of improvement, rather than radical transformation. Best App: On a daily basis, I am guaranteed to use two apps at school on my iPad: forScore and Keynote. forScore is a PDF music reader, and Keynote is Apple's mobile presentation software. There are other apps that I use for similar purposes (unrealBook, Chromatik, and Explain Everything), but these two apps have been my go-to apps in 2012. Since Keynote continues to lack the ability to (easily) link music and to annotate presentations, the award has to go to forScore. Best Tablet: As 2012 draws to a close, all of the hype of competing products to the iPad seem to have faded away. The Microsoft Surface has failed to gain traction, and it seems the the Google Nexus, Kindle Fire HD, and Barnes and Noble Nook HD are competing for a distant second place in the tablet market. I truly believe that all of these tablets are wonderful devices, and would be world-changing if we lived in an iPad-less world. But we don't. The iPad still offers a better user experience, a wider variety of quality apps, and a user base that encourages further development. I know the home-brew fans like to tinker with their operating system, and that the Apple tax (in other words, making a profit) is distasteful to some–but at the same time, Apple's continued profit results in continued development–and even the return of some more jobs here in the USA. On a personal note, I think the iPad mini is having a profound effect on the market place (I bought one for my wife for Christmas, and finding anything but a 64 GB iPad mini was nearly impossible). But I don't think the iPad mini is ideal for schools–particularly when it comes to secondary music education. The real winner is the 4th Generation iPad, which is twice as fast as the 3rd Generation device, with generally the same specifications. I bought a 4th Generation iPad, and I've been very happy with it. Best Accessory: The accessory market has been greatly impacted by the new lightning cable that comes with every 4th Generation iPad, iPad Mini, iPhone 5, and 5th Generation iPod Touch. Manufacturers are just beginning to make accessories with the lightning adapter, so any accessory I recommend will not be a “wired” accessory. The AirTurn seems to continue its dominance as the foot pedal to use with an iPad, although I certainly like my PageFlip Cicada. The Justand is a great accessory for use in the classroom, turning an iPad into an overhead projector or document camera, but most music teachers will not find it as a necessary accessory. So I'll vote for my favorite stylus of 2012, the Maglus. In full disclaimer, my first Maglus broke on me, in a number of ways. The rubber tip cracked, and one of the rubber sides unglued from the stylus, letting the magnets go free (I'm still not sure where they are!). I ordered a second Maglus, which now offers a replaceable tip. So far, my new Maglus is holding up. I also very much like our Vers 1Q speaker. Look for a review of the Vers 2Q soon! Most Exciting Music Ed Tech Product of 2012: Without a doubt, Chromatik is the most exciting product to hit the market in 2012. Chromatik is a way for musicians to share music with each other, and there are a few other features with more to come. Chromatik made a splash via American Idol and several rounds of funding (including one from Bruno Mars), putting it on the map long before it emerged as a product the public could use. A very good iPad app is available, or you can use your computer/Flash to read music. You can also make a recording of yourself and send it to others. The service is free, and they've even had a campaign where they will give an iPad to a school if they get 100 students to sign up for the service (yes, my school did this). It's going to be exciting to watch the features that are added to Chromatik in the coming months. Most Improved App: Sneaking “under the wire” is Notion for iPad, which is the best music notation app for the iPad. It's main competitor, Symphony Pro, has simply disappeared from the App Store as well as from the web (there is a note that Symphony Pro 3 is coming soon, with no other news). Notion has made it clear that the iPad app is going to be greatly improved in the coming months, and they've started by adding some of the most requested features to the app at the end of December. Most Shocking News: Also from Notion. They released their 4th Version of their PC/Mac program, and priced it at $100. Best Free Program: MuseScore, a free music notation software program, is becoming more functional with every update, and is a real contender to Finale and Sibelius. It can't do everything Finale and Sibelius can do, and there is very limited technical support (unlike Finale's free tech support). But it is free and it works. Most Anticipated App for 2013: SmartMusic for iPad. It is coming in the spring of 2013 to an iPad near you. SmartMusic can revolutionize how students prepare music, as well as how they are assessed–and this will be even more true when the SmartMusic is available on school and personal iPads. Expect many music programs to request iPads in place of “traditional” computers in the coming months. Most Useful Blog: I keep track of several hundred blogs, and the blog that always seems to bring the most insight is The Loop by Jim Dalrymple. Jim is used by Apple to unofficially verify or deny specific Apple rumors at launch time. He is gregarious, and seldom writes more than a paragraph at a time. However, he links to full articles of all kinds. A word of warning: he's not afraid to use foul language online, which can be abrasive and not-safe-for-work or children (although he almost always uses it for humor–particularly on Twitter). I also enjoy reading every article by the Macalope. The best tech tips have been on OS X Daily. Worst Update: I really liked Skitch, an annotation app, before it was bought by Evernote and “updated.” Skitch 1.0 was so easy to use; Skitch 2.0 is not as easy to use, and Skitch 1.0 drawings are stored in an unusual way. Most Promising Feature: The text editing in WriteUp, a typing app for iPad. It allows you to quickly scroll through text, and a lot of people think Apple should buy this feature and integrate it. The App Recommended By My Students: Notability. My iPad-using students have searched for apps that make their life better. Notability allows them to import a worksheet as a PDF, write directly on it, and send it back to a teacher. Workflow always seems to be a challenge on the iPad, and it is great to see when students can figure out a better way around. I still like Noteshelf for notetaking, but it is taking Noteshelf too long to add PDF import. Most Useful Utility: Dropbox. I have two accounts: a school account and a personal account. I can share the entire school account with my students, and can share particular folders with that account, without having to open my own account to students. So many apps take advantage of Dropbox. I can only hope that iCloud starts to offer some of these features in the future. Deep Dish Designs GigBook (a PDF Music Reader) recently added Dropbox integration. Best Android App for Music: EZ PDF Reader, although far from being forScore or unrealBook, seems to be the best option for PDF music reading on the iPad, at least until Chromatik comes out with a native app (or HTML 5 app) for Android. Mobile Sheets added annotation, but I found that feature to be hard to use. In closing, most of my “Best of 2012” items are not new to the marketplace. It was a year of refinement, and a good one at that. As schools are on the precipice of going all-digital, we need to keep several things in mind. First, not all courses are “core classes” with a desk. Although notebooks and Chromebooks are enticing–particularly on price–we have to ask if those devices fit in all classrooms. Second, music publishers need to find a way to push music out digitally at a lower cost than printed music, as well as to convert existing libraries or allow teachers to legally convert existing libraries for a very small fee. Third, notation software companies should be researching the ideal formatting on a tablet (both iPad and wide-screen Android), and should be offering that formatting as a template to music publishers (and anyone that “prints” music). 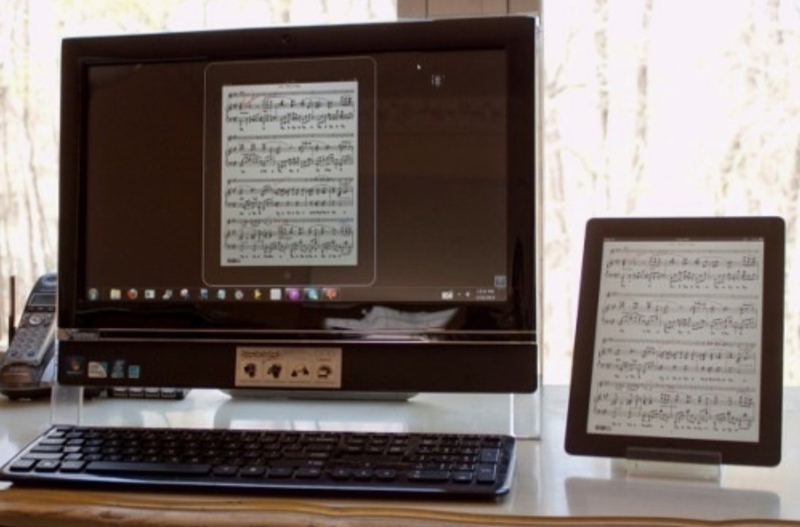 Realistically, you should be able to buy or print a score that is ideally formatted for your device, whether you sing in a choir or play in band, orchestra, or a garage band. The iPad wouldn't be “too small for music” if the music was formatted for the iPad's screen. Finally, it is time for all software companies to get on the bandwagon of iOS, if not Android as well. It was prudent for companies to wait it out…but that time has passed. Nothing should be programmed solely with Adobe's Flash. Every major piece of software should have an iOS version–if only a reader–as part of the “package.” Just one example: shouldn't a marching band field show be available both on the PC/Mac and the iPad? Why is there no iPad version? Wouldn't you want that entire show with you on the field, with the ability to make edits? And shouldn't you be able to distribute that entire show to your student's iPads (along with their music)? 2013 promises to be an exciting year in technology and in technology in music education. I'm looking forward to it and talking about it as it develops! I just arrived home from school (10:40pm) after the latest performance of our school’s musical. I’ve been working on moving our current literature to Chromatik so my students can have access to those resources–if they wish–via Chromatik at home. Overall, the process is easy, and there have been some small glitches (some PDFs just do not want to upload). But for the most part, it works. I have a thirteen-inch MacBook, so perhaps a fifteen-inch MacBook would do a better job of rendering these pages. But to be honest, I’m skeptical if any widescreen notebook computer can do Chromatik justice. I do think that a twenty-one or twenty-seven inch iMac would be up to the task…but my MacBook (and I think the thirteen-inch is the most common size) just doesn’t show Chromatik’s resources very well. Simply put, the iPad gains nearly 2″ of diagonal space over the MacBook. In other words, the MacBook has nearly the same height of display as an iPad Mini. So if you are viewing music two pages at a time on Chromatik, the image is going to be significantly smaller and hard to read than on a full-sized iPad; and the iPad Mini may even make a better option, as the images on the Chromatik iPad app might be tweaked for that application. Don’t get me wrong here…I’m not complaining about Chromatik (in fact, I’m praising their iPad app and its use of screen space), but I’m making a statement about widescreen versus 4:3 devices. It comes down to this: Rueben Puentedura’s SAMR model, where the first step of technology integration is SUBSTITUTION. I stand convinced–even more so at this moment than a week ago, and I was already convinced–that the primary way to get technology into music education is as a substitute for music. The AMR of SAMR will follow. If your school adopts widescreen computers (MacBook, Windows, or Chrome), you simply will not be able to easily integrate those devices into your middle school and high school programs, which are heavily skewed towards BCO (Band, Choir, Orchestra). If you integrate, you have to enter at the M or R phases of SAMR (Modification, Redefinition), and that’s an unnatural jump. It’s an interesting point, because there are companies that have made good use of widescreen formatting, such as MakeMusic with SmartMusic. But the truth is that MakeMusic can modify SmartMusic to a 4:3 format without too much hassle because they have already been working with making music visible on a reduced-height screen. Some of the menus that exist in SmartMusic can always be moved to a drop-down format on an iPad app. So in other words, it isn’t a “stretch” to take a widescreen resource and modify it for 4:3. The reverse, however, isn’t true. Putting 4:3 on a widescreen device isn’t very nice. Think about it: we’re used to word processing on 16:9 or 16:10 widescreen monitors because we have to. But the truth is that it isn’t natural, and you have to do a lot of scrolling. I’m having to do so as I type this post on WordPress! Even Finale, my music notation software of choice, is something that we get used to using in widescreen, but in reality, most of the material exported out of the program is in a 4:3 format of some kind. So even that isn’t natural, but we accept it because we always have done so. Let’s be honest: widescreen is for the benefit of the video industry. And it is great for movies. But for the rest of life, it stinks. So if you want 4:3, what are your options? I know of 3, and only three, at this time: the iPad, a Coby 4:3 tablet, and the Kuno tablet. All desktop and notebook computers feature widescreen monitors, and nearly all the other Android and Windows 8 tablets are widescreen. The push for widescreen devices come from subjects or IT personnel that either a) have resources that require a specific platform (1), or b) hate Apple. Meanwhile, music and a huge number of other subject areas could benefit from a 4:3 device integrated into their curriculum. This includes family and consumer science, visual art/graphic design, physical education, and any subject that deals with 4:3 original resources (including digital photography!). So, this entire blog entry, basically a rant against widescreen devices in 1:1 situations, is due because of my experience with Chromatik today as I looked at a score in full screen view on my MacBook, and compared it to my iPad. Here’s my suggestion: go register for Chromatik, and then download the free app on your iPad. Compare the program on your computer to your iPad, and see if you come to the same conclusion. Friends don’t let friends adopt widescreen devices in 1:1 settings. (1) Ironically, a school adopting a device like an iPad or even the Kuno (another 4:3 device) could save so much money versus outfitting a school with MacBooks or another computer that the money saved could provide sets of mobile computer labs for those specific subjects needing specific hardware, such as PLTW biomedical studies or PLTW engineering. (2) Although I don’t reference this in the blog, I’m still wary of the Chromebook, as I don’t see how it can ever find a “S” in the SAMR model for music and many other subjects. Most of the raving Chromebook reviews I see by teachers and students are focused on the “core areas” where computers are basically used for web searching, citations, calendars, blogs, and writing papers. Technology integration and 1:1 is supposed to be more than simply substituting a device in place of taking your class to your media center’s computer lab. Simply using a 1:1 technology for glorified word processing isn’t integration…it’s something else. Last night, my family headed to the Mall of America, where there happens to be both an Apple Store and a Microsoft Store–across the hallway from each other (very close to LegoLand). My first stop was in the Microsoft Store. I was very enthusiastically greeted by no less than five workers–and the store was busy. However, I was able to simply interact with a surface on my own, without any salesperson walking me through a sales pitch. I knew a few of the gestures that allowed me to interact with the device–but not all–but there is a “Microsoft” button on the bezel of the device that always takes you to the home tile screen. The Surface is a nice device–it’s well made, it seems to run just fine. The catch is that the tablet only runs Windows 8 RT apps, and normal Windows apps (such as Finale, Sibeluis, SmartMusic, etc.) won’t run on the device. Schools running on a Windows environment won’t be tempted by this $499 tablet because it has no crossover functionality other than for Office, which has been packaged by Microsoft specifically for the Surface. Another “knock” on the surface is that the 32GB surface comes with only 16GB of useable space–everything else is taken up by the operating system and core programs. So even though the 32GB surface is lauded for having 32GB for $499 versus a 16GB iPad…that iPad will have 12 GB of space, as the OS and core programs only consume 4GB. Granted, the Surface has a (micro?) SD card slot…but there was a lot of “We’ve got 32GB at this price point” going on that was, in effect, misleading. I don’t have a listing of the over 10,000 apps for Windows RT, so I don’t know if there is a PDF music reader available. I did load a copy of the Messiah from IMSLP, and it displayed FULL PAGE on the widescreen Surface. Yes, I could zoom in, but it seemed funny that the default PDF setting was full page. The surface is widescreen (could it possibly be wider than 16:10?) so reading music in landscape mode will never be acceptable unless you use a free-flowing format like MusicXML (granted, free-flowing music is acceptable on nearly every tablet). I turned the surface to landscape mode, and interacted with the score, which ulitmately was not much wider than seeing it on the iPad Mini. The Surface keyboard seemed to work well, although the “no-give” keys take a little “getting used to.” That’s a strong accessory, and I wouldn’t be surprised to see Apple come out with something like it in the future (it might even be smart for Microsoft to make an accessory like that for the iPad. Money is money.). Ultimately, I can’t recommend the Surface (RT) for schools at this point, and I surely can’t recommend it for music. The full-Windows 8 version of the Surface…coming soon…may be another matter. The surface is an ideal tablet for someone that basically surfs the Internet, writes e-mail, and needs Microsoft Office, which was the general definition of computing before the iPad. As for the iPad Mini, well, it’s the iPad Mini. I went to the Apple Store with a credit card in my pocket in the event that I used the device and decided I couldn’t leave without it. Ultimately, I could leave without it, and I did. I don’t really have any complaints about the iPad Mini, and I could see it fitting into my life in a number of ways. For example, I read on my iPhone every night before I go to bed, and not the iPad. The iPad Mini would be perfect for that. I could also see having two iPads on my piano music stand at school, one open to music, and the other open to things like our attendance system, Class Dojo, and the like. After all, both iPads together still cost less than a MacBook Pro. I couldn’t justify the $429 (I wouldn’t recommend the 16GB…it’s just too little storage) knowing that I still have to pay off my new 4th Generation iPad. Now…if that Mini had the same processor chip as the iPhone 5 and a retina screen, I might be typing this blog post on an iPad Mini at this moment–but that isn’t the case. Are you worried about the iPad in the world of widescreen formats? The Portrait vs. Landscape orientation optimization could be a deal breaker for some users, especially if you rush to judgment. I loved the Portrait orientation of my iPad and worried about my transition to a Landscape optimized world. I have no problem if Mr. Berenson prefers a widescreen tablet. But to be worried about an iPad's usefulness in the future because it doesn't have widescreen is, well, a bit crazy. Killer hardware feature of the mini? 4:3 screen. Totally different experience to Nexus 7 and far more flexible, IMO. The fact is that we live in a world of both widescreen and 4:3. Widescreen is at the center of entertainment, whereas 4:3 is the world of paper (this obviously includes music). Maybe we will do away with paper someday…but for now, our culture is firmly rooted in 4:3. This may change someday, but not within the lifespan of any device that people are purchasing today. This is further emphasized in the fact the Amazon and Barnes and Noble are selling devices in 4:3 format, too. And the great irony is that most of us are still creating paper documents on widescreen computers–rarely being able to see an entire page at a time. My plea to Apple is that they would consider making Pro versions of the iPad in a 11.7″ 4:3 size. Again…if you want a Surface or an Android tablet…buy one. Buy what YOU want. It's your money. But speak from the aspect of your preference rather than making up crazy points of logic. I'll try to do the same as I defend my choice of the iPad. By the way, I choose the iPad for both personal reasons and as the tablet I would recommend for schools (different reasons). The 4:3 screen and our paper-based society is a point in both cases.